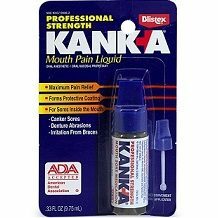 This is our review of Kanka Mouth Pain Liquid. It claims to be the complete solution for canker sores and other abrasions in the mouth. It delivers strong medication to the abrasion and then forms a barrier for long-lasting protection. This product also comes with an integrated applicator to provide you with an accurate, mess-free application process. It is recommended to first dry affected area and apply medication with the applicator. Use up to 4 times daily, but not more than every two hours, or as directed by a dentist or doctor. Do not use this product if you are allergic to local anesthetics such as procaine, butacaine, benzocaine or other “caine” anesthetics. You shouldn’t use this product for more than 7 days. If symptoms don’t improve after 7 days, worsen, or if swelling, rash or fever develops, see your doctor or dentist promptly. Do not exceed recommended dosage. Keep out of the reach of children. If a large amount is accidentally swallowed, get medical help or contact a Poison Control Center immediately. Kanka Mouth Pain Liquid is sold for $6.79 for 0.33 fluid ounces. This is a bit more expensive than other products that claim to do the same thing but also won’t break the bank since it only may be needed occasionally. They say that satisfaction is guaranteed on the label but don’t mention any return policy or money-back guarantee. This product isn’t sold on the manufacturers website so therefore each return policy will be different depending on where you purchase it. There were mixed reviews for this product. 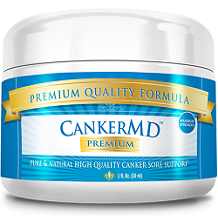 Many said that it cured their canker sores very fast but other customers said it didn’t work, was a sticky mess that got all over their mouth, and ended up numbing the rest of their mouth. There are a couple of things we liked about Kanka Mouth Pain Liquid. It is sold for a pretty fair price for a product that will only need to be used occasionally. There were also many positive customer reviews saying that this product was very easy to apply and it really worked while protecting their abrasions from further damage. There were a couple of things we didn’t like. They mention that satisfaction is guaranteed but we weren’t able to find any more information about that. There were also a bunch of customers that felt that this product didn’t do what it claims to do. Others were also upset how it got all over their mouth, causing numbness all over. We feel that you will be able to find something better elsewhere.